It’s no secret that weed just goes so well with yoga and meditation. While the practice of mixing spiritual activities with cannabis dates back to ancient times, more users around the world are reviving the use of the plant with yoga and meditation around the world. Cannabis is a great way to enhance your yoga and meditation practice. In the yoga community, cannabis use can still be somewhat controversial, but if it works for you, you should by all means use it. Cannabis use has helped thousands go deeper into their practice with less mental distractions; it’s also good for those who struggle with depression and anxiety which makes it difficult to relax for these spiritual activities. Another way that cannabis can help is that it can reduce the physical pains that occur when we stretch for yoga. Granddaddy Purple: This famous indica has powerful relaxing properties. For many, just a whiff of its berry-scented aroma can already induce you to a state of zen. Smoking some Granddaddy Purple will melt all your problems and tensions away while putting your body in a euphoric state of total tranquility. Granddaddy Purple is known for its potent calming properties but it won’t give you a couchlock - you’ll still have enough in you to do some active yoga if that’s your thing. Blue Dream: If you’re looking to get into a state of deep dreamlike tranquility, try Blue Dream. 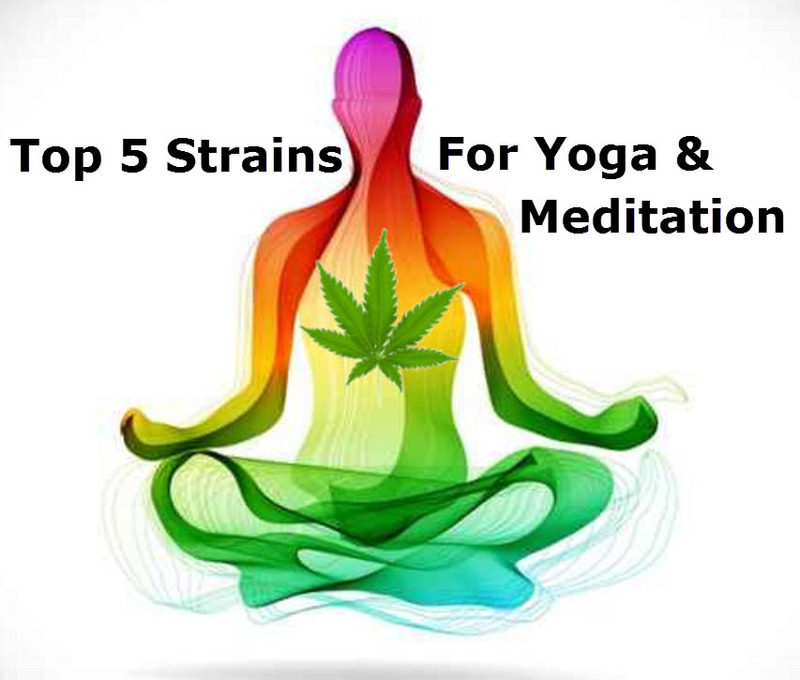 This is a top strain among users who use the plant for meditation practice. Blue Dream will give you a good cerebral high while relaxing every inch of your body without sedating you too much. It will transition you into a light, peaceful state while the sativa in the plant will help keep you alert. Northern Lights: No other strain is as potent an indica as Northern Lights. Users love it for getting them into a deep body-numbing state; it’s no surprise why many also rely on Northern Lights as a cure for insomnia. This strain gives a wonderful head high and after a while will help to relax every muscle throughout the body. Northern Lights is highly recommended for meditation as well as active forms of yoga that require bends and stretches. Cannatonic: Ideal for those who have a difficult time getting into a meditative state because of constant worries and anxieties. Cannatonic has the ideal THC and CBD levels necessary for getting the brain to fight off depression and anxiety. This strain is also known for encouraging the levels of mycrene in the body, which prevents paranoia while promoting relaxation. Cannatonic is also known for giving a short high, which makes it the perfect strain for anyone who wants to use it only for yoga and meditation but wants to get sober right after. Be warned, though - cannatonic is also known for its strong aroma, so if you’re going to a class and trying to be discreet, smoke this strain while you’re still at home. White Widow: Hailing from the Netherlands, White Widow is now one of the most famous strains in the world for many reasons. It’s loved for its ability to encourage creativity, which makes it the ultimate strain if doing something creative also soothes you. Think: adult coloring books, playing musical instruments, cooking, or crafts. White Widow gives you an uplifting head high that will make you want to connect with the universe or with other people while in a state of calm and peace. White Widow is ideal for active forms of yoga as well.